How to Increase profit in Your Business. A business owner’s main goal is to remain profitable, and while it may seem like increasing sale prices or cutting costs are easy ways to achieve that – business finances are seldom as straight-forward and those two strategies alone cannot result in high profitability. So the question remains, how to increase profit within your business? In this post, we will share several different ways to increase profit in your business, ranging from marketing activities to increasing administration and operational efficiencies. Lead generation is the life-blood of any sales-oriented business. A steady flow of leads ensures that monthly, quarterly and yearly sales targets are met. However, an improved lead generation process can significantly contribute to increased sales and consequently higher profits. Today, digital marketing is a crucial activity to businesses across all types of industries. As a result, a lot of your lead generation may be happening online (or you may need to move it there) and you should ensure that you invest in online marketing activities and channels to maximize your long-term profitability. Getting potential customers inside the door is one thing, convincing them to buy your products (or services) is another. So how do you increase profit by increasing conversions? While lead generation is step one, improved conversion rates are what seal the deal. If you can increase your conversion rate from ten percent to twenty percent, you can effectively double your sales and increase profits. The importance of you being able to convert qualified leads into paying customers can never be overemphasized, and sales training is a sound investment to help you and your team successfully turn your leads into buying customers. There is a reason why customer satisfaction is so important. Satisfied customers not only give positive reviews about your business or products, they also tend to increase their value to your business with repeat purchases in the future. In order to increase profit in your business, one of your goals should be to increase the volume of sales made to existing customers. Think in terms of expanding market depth rather than breadth. Two of the most successful strategies for achieving this are upselling and cross-selling. These terms are frequently mixed up by a lot of people but they mean two completely different things. With upselling the trick is to attempt to get a customer who has completed a purchase to upgrade to a more expensive option (McDonald’s upsells you drinks and fries). Cross-selling is a similar technique in the sense that your goal will be to encourage the customer to buy complementary or related items, such as accessories and so on. When you have exhausted the mileage of a particular customer in terms of upselling, you can then cross-sell them on a different product line and repeat the process. Sometimes the best way to increase your profits is to literally increase your profit margin. A lot of small business owners are hesitant to increase their prices for fear of losing customers, but the truth is that customers do expect periodic price increases. If you haven’t reviewed your price list in a while, this is one of the most direct steps you can take to increase profitability. It’s really simple. If you increase the price of your product by a dime and hold costs constant, that dime flows directly to the bottom line as profit. This is one factor that most small business owners tend to ignore or devote very little attention to. You need to be ready to spend money to bring in more money. This means being open to investing in marketing and promotions. The good news is, this is getting increasingly cheaper with digital channels, which are also immensely effective. This does not mean you should engage in promotions for the sake of promotions – this is all about getting expert advice and recognizing the most effective marketing mediums suitable for your business and then running focused, clearly defined and measurable campaigns. Done right, whether it’s traditional marketing or digital marketing, you should be seeing positive results, increased brand awareness, increased number of leads and sales and consequently more profit. If you offer great service, customers will be happy to recommend you to their friends and business contacts. Your job to look for ways to develop one or more proven referral systems for your business. For example, you can offer rewards such as discounts to customers who make referrals or allow your customers to claim points against the spending of their referrals. While you’re trying to satisfy your customers, you must also make sure that every dollar you spend contributes to your profits in some way. At times, instead of expanding, you need to evaluate your business and take steps to cut off unnecessary services, features and activities. Often, stores or shops which experience an increasing volume of online sales, decide to close down physical locations in order to cut out costs and increase profits. Knowing when to take a step back is as important as knowing when to expand aggressively. This is not always a good idea since many small business owners struggle to maintain control over quality and other factors when they start expanding their product (or service) offerings. However, if you start by expanding your line to include products that are closely related your existing ones, the process can be smoother. Expanding your product line will potentially open up your business to new markets and customers, and dramatically increase room for profitability. 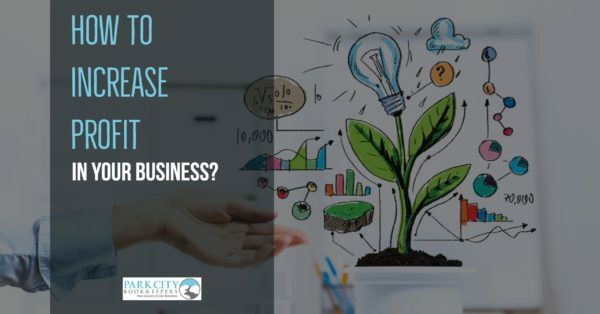 As discussed in this post, there are several different ways to increase profits in business, but the key in any of these methods is to evaluate their suitability for your particular business. Not all businesses benefit from expansion or pull backs, and not all businesses are suitable for e-commerce and so on. However, with a proper picture of your finances, you should be able to make prudent business decisions. At Park City Bookkeepers, we provide a host of bookkeeping services, including flexible services for small businesses, aimed at helping them understand their finances and increase profitability by facilitating informed choices. We offer consulting services to help you improve business processes and increase profitibality. How Much Can I Sell My Business For? Where to Get Started. What Does Earnings Before Taxes Mean for Your Business?